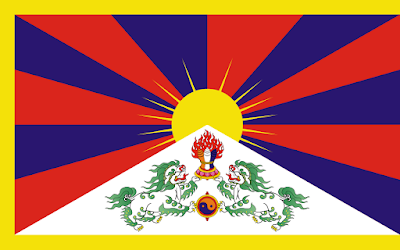 This flag just past the 100 year mark- it was adopted 101 years ago by the 13th Dalai Lama (the current Dalai Lama is number 14) in 1916 and has been banned by the Communist Chinese authorities in the Tibet Autonomous Region since 1959. If you like symbolism, well you've come to the right place, because this flag is chock full of it. The yellow border/adornment stands for the teachings of the Buddha ("which are like pure refined gold and unbounded in space and time, are flourishing and spreading." ) The white triangle that dominates the bottom of the flag stands for a magnificent snow clad mountain, which represents the Nation of Tibet. The six red bands across the blue dark sky stand for the original six tribes of the Tibetan nation. The combination of the blue and red bands stands for "the unceasing enactment of the various deeds of protection of the spiritual teachings and secular life by the black and guardian protector deities with which Tibet has been connected since time immemorial." At the tip of triangle, the Sun with its rays represent "the equal enjoyment protector deities with which Tibet has been connected since times immemorial." The snow lions on the slopes of the mountain standing for the accomplishment of a unified spiritual and secular life. The three colored jewel held aloft stands for the reverence held by the people of Tibet for the three gems, "the object of refugee Buddha, Dharma and Sangha." The jewel held between the lions stands for the "people's guarding and cherishing the self discipline of correct ethical behavior, principally representing and spreading the ten exalted virtues and 16 human modes conducts." I did a little more than my usual dig on this flag, because the Wiki-page had a good description of the history and the design process, but not so much with the symbolism, but happily Flagspot.net had exactly what I was looking for- huge h/t to them for the info on this post. I love this flag. I wish I had it in the collection, because honestly, I think it's the perfect balance of symbolism and good design- it's busy, but not too busy and use of the white triangle to represent the snow clad mountain focuses the design on the center of the flag and the sun, the red and blue bands do the same as well. It's focused, it's packed with symbolism and it's striking. What more could you ask for in a flag? I know that there are some pickier vexillologists out there that would argue it has too many colors and is too busy, but I disagree- this is the kind of flag that I would love to add to my collection. But until next time, keep your flags flying- FREAK or otherwise!